Hey guys, Happy Monday! I was literally SO excited when I got these photos back. How cute is my patriotic family?? Isla and Dash’s bandanas kill me! The Fourth of July holds some of my nearest and dearest memories from my childhood. 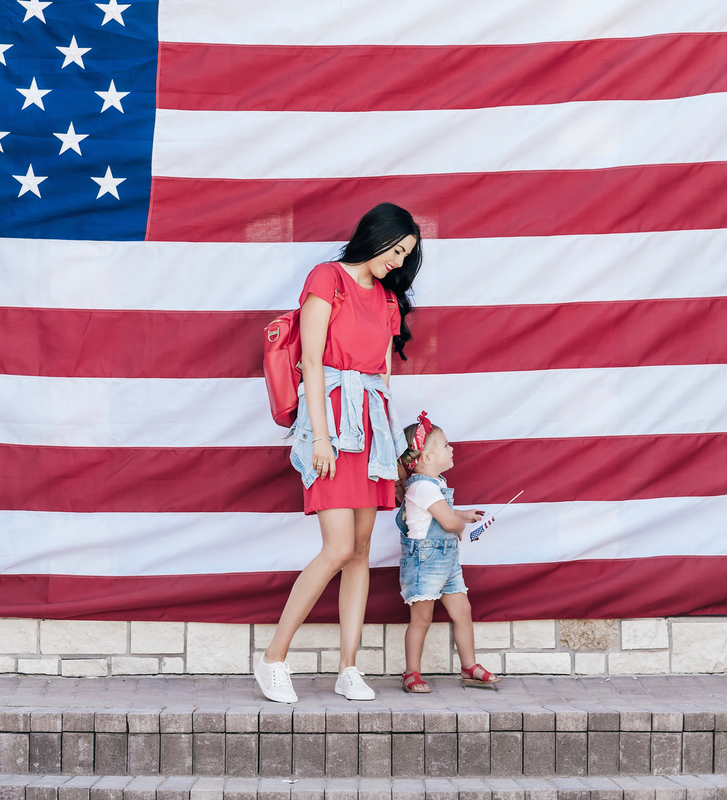 My mom always tried to make it special and taught me and my sisters how to be a proud, patriotic American and to honor those who sacrifice so much for this great country that I am blessed to call home. Now that I’m a mom I want to make sure Isla and Jackson have fond memories of this holiday too! I’ve always wanted a big flag to hang on my home and this year I finally got one! I found it at Colonial Flag (right off 1o6oo south for those of you who live in UT). Before the Stadium of Fire on Saturday night I made the family take some pictures of our coordinating outfits (Drew was annoyed) but they turned out so cute!! My s’more dessert was a hit and Isla was completely terrified of the fireworks show. She literally had her face pressed up against mine and was holding on to me for dear life. I secretly loved all the snuggles I was getting though! What are you all doing for your Fourth of July festivities?? Spray 9×13 pan with pam (or melted butter). Line entire bottom of pan with Graham Crackers. Line Chocolate Bars over Marshmallows. Line Graham crackers over Chocolate. Finally, line Marshmallows over Graham Crackers. Put in oven on 350 for 10-15 min or until golden brown (watch them close). **The more marshmallows your put on the more gooey it will it be! I wish I would have added a little more to mine! Those s’mores look sooo delicious! What a cute family! Isla looks so cute in those overalls! Love these photos, and all your outfits are so on point! Happy 4th of July Rachel and family! This photos are so cute! I love Isla’s little outfit, that bandana is so adorable! Oh my gosh these photos are so darling! I think your coordinating outfits are so cute (but I know my hubby would roll his eyes at me too hehe!) but I think you’ll cherish these memories forever. Happy 4th! What an adorable family! These pictures turned out great. Happy 4th! 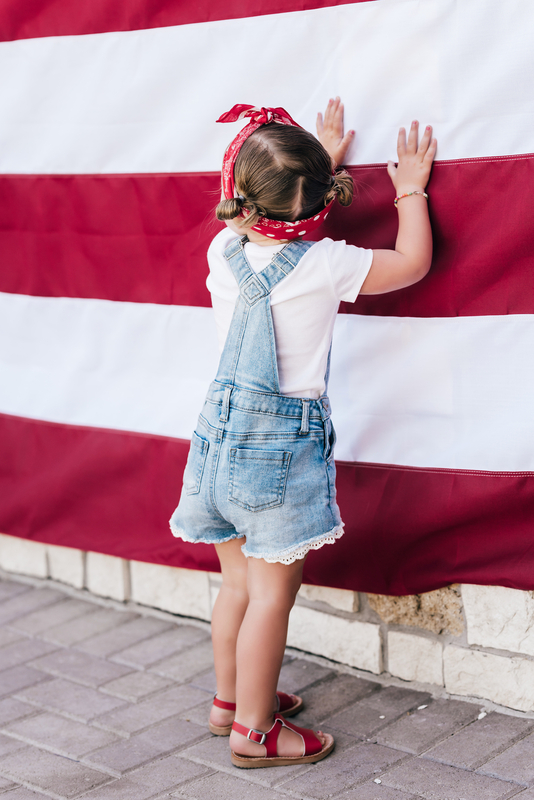 Incredible shots – you guys look so 4th of July! Rach, I love your little patriotic family so much!! I always love following your posts and this might be my favorite one yet! I hope you have a lovely rest of your long weekend! PS I’m totally going to try that s’mores recipe ASAP!! I love this!! Such a beautiful family! Also I loved your InstaStory from the day it made me happy to watch!! ?? Your family is the CUTEST!! Love these photos. Happy 4th! These photos are adorable! I want those sheet pan s’mores right now. Your family is adorable! Happy 4th! These pictures are so darling! So cute! & Omg YUM!! Still drooling over those s’mores! Can’t wait to try them! Your babies are too cute, including your pup haha! Love this dress! http://trendkeeper.me – “skinny” 4th of July recipes/drinks! The pictures are amazing and so cute! Happy 4th of July! That Poppy Fawn Design is everything! ??? and your little fam is the cutest! Happy 4th of July! would love to win the diaper bag! having a little baby boy in november!! the poppy color is perfect. That Dessert looked so yummy!! I can’t wait to try it! And hopefully get a fawn design bag! ? Oh my gosh, these pictures ??? Love all of your patriotic looks! Isla’s bandana is the cutest thing ive ever seen! cutest outfit rach! happy 4th! Your little family is so precious! Happy 4th of July! Love your patriot family photos! Would love to win this bag for my 8 month old! Love your blog!!!! I’m new and now obsessed. And ?For the poppy fawn design bag!!! And drooling over that s’mores dessert! I loved your story on the s’mores dessert! I am totally gonna make that! Also Isla is sooo cute!! I LOVE the Fourth of July and especially the poppy fawn bag! Love the Fawn Design bag!!! The fourth is my favorite holiday!! These pictures are so darling! So glad I’m not alone when I make my husband and little boy match for holidays! Enjoy your fourth festivities!! ❤️??? I love your blog and all your pictures ❤️? You have the cutest family!! Happy 4th ?? Such a darling family!! Rach your lip color is PERFECT in these photos. Hope you guys have a fun and safe fourth! So cute ❤️ Love the bag!!!! ??? So so beautiful!! The kids look perfect!! I need to get my hands on that bag! Perfect patriotic color ?? So trying that s’mores desert! ? Your family is just the cutest! Little Isla is seriously a doll! LOVE your 4th of July post! The flag in the background is ?? and your Fawn Design bag with matching outfits is adorable. Makes me want it all!!! Happy 4th of July!! These are adorable!!!! ? Loving your whole look. We’ll be in our town watching the parade and BBQing. So fun. Love, love, love your blog! What a gorgeous momma you are! Absoulty the cutest family! ??? I love the outfits!! ??? your kids are the cutest!! I love the way your dress your kids, they always look adorable, I always go to instagram page to get inspiration for my little girl outfit, cause Isla always looks adorable!! The diaper bag is everything ??. Awesome post girl!! ?????? Omg. Everything about your outfit is amazing. Love your style. And you’re little Ohana is ??? Such a beautiful family!!! Love the pictures!! !✨Have a happy July 4th!!! ? Love your fawn design giveaway! The cutest pictures!! Love following your insta & blog! ❤️? Your family is just the cutest! Little Isla is seriously such a doll! I need my pup to pose for pictures like yours! The pictures are too adorable ?? love them! You’re family is the cutest! Happy 4th!! ❤️??? Love your blog and your fawn bag! Love your sweet family & blog!! I saw your Instagram giveaway with Fawn Design and would LOVE to win a Poppy bag!! I saw your post awhile back with it and loved it >> hinted at my husband to get me another fawn bag for Mother’s Day, but in Poppy and they weren’t available anymore when I went get him the link ?. Thanks for the awesome giveaway, Rachel!! Love this! So cute. ? The bandanas are just too cute! What a precious family:) Happy 4th! Love the Independence Day photo shoot! What a great idea! I might be inspired enough to shoot some pics tomorrow of my boys. Happy 4th of July ? Your photo shoot is the cutest! It come out adorable ? Beautiful family! Making your smore dish tomorrow, have been craving it ever since your insta story! Love your post and would LOVE to win this bag!!! Absolutely precious family!! So happy to start following you!! ?? #happy4thofjuly!! I love the partriotic family photos! 4th of July is one of my favorite holidays. I love getting together with family. We usually have a pool day and then go watch fireworks at our mall! Your family photos are very cute. Love how simple and easy they are to create (although I don’t think I would’ve thought about it) yet they are soooo cute. 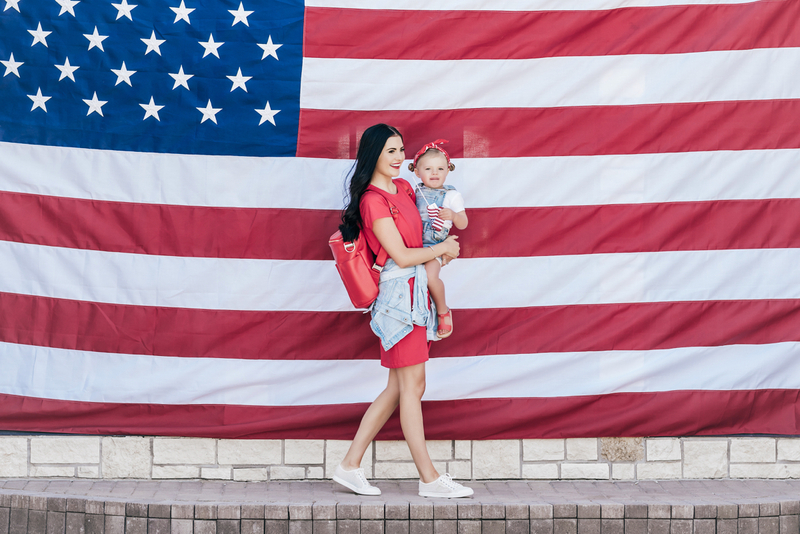 Your outfits are on point and love your fawn design bag (currently have my eyes set on one lol)…happy 4th of July ?? Loving the outfits! Can’t wait to bake the dessert too ?? Thanks for giving us modest options, and something for the whole family. Love your blog, been following you for years. Love fawn design! What a perfect giveaway!! The cutest family!! I love the outfits and flag, everything ??? All so cute and so yummy. The people and the food!! Love this color!! Entered the giveaway!! Such a cute patriotic fam!❤️?? Love your pictures! They are beautiful! Your pictures turns out beautiful! ❤️ Can’t wait to try out your s’mores dessert! Love the poppy fawn bag! Missed my chance to buy one, thank you for the opportunity to win one! Very cute family photos ? I love the outfits!!! So classic and preppy!!! I would LOVE to win the Fawn bag!!! Been loving fawn design forever. ? Fingers crossed. Such cute pictures!! You have a darling family, seriously so cute! I have a little Isla as well, she’s just 4 weeks old though :) Hope you guys have an amazing holiday! These pictures are absolutely darling?? These pictures are so great! Can I have Isla’s outfit in my size…I mean so cute! Happy 4th! These pictures are SO fun! And that s’mores dessert looks so tasty! Such a cute photo idea and family! I absolutely adore these pictures! This is my first 4th of July with my son. I can’t wait to make traditions for him and I. I love your blog and look forward to reading more of your blog. Such a sweet family! You always look the cutest for the Fourth of July! This is gorgeous! I’m dying for the fawn design poppy! No idea what happened to my previous post as I do not see it posted ? Anyways. Your family pictures are supper adorable ?? Love your fawn design and hope I am the lucky winner. I’ve been eyeing one for a few days already. I had seen them before but didn’t know the brand until I went to my bf’s bother work picnic and spotted one and googled it. I immediately fell in love with it and even went and return the bag I had just gotten like 2 days before (hadn’t used it) so I could convince my bf to buy me one lol. Good luck to everyone and hope you and your family have an amazing 4th of July. Thank you for the giveaway. Ahhh!!! Absolutely gorgeous family photo shoot!!!? Beautiful pictures of a beautiful family!! Happy 4th of July!!??❤? These pictures are so cute! Love all the matching outfits! I’ve been curious about the freshly picked sandals for my little one. They look so cute on! Wow love this diaper bag. Currently using my old one for my infant and would love to get a new one ? I love your diaper bag!! ? Would love to win one in your giveaway for my little girl coming in November!! ??? Love the 4th! This year we are celebrating with my family in Kaysville and going to lagoon! That flag is INCREDIBLE! Looking forward to making memories of our own this Fourth of July! Love your blog. Very inspirational. Your photoshoot is the cutest! Everything about it is adorable ? Darling photos! Can’t wait to try smore dessert! Love it! That bag matches perfectly! Those s’mores look incredible! Where did you find that recipe? I cannot get over Isla’s darling outfit and buns! Hoping I win the Fawn Design bag. I’ve been loving that bag ever since I first laid eyes on it. All the feels for this perfect bag! Your family is absolutely adorable! And I’m totally making those s’mores tomorrow. I’m 20 weeks prego and I NEED them ? So cute! Happy 4th of July! Love your pictures, such a beautiful family! Happy fourth! These pictures are to die for! So cute! I would love to be considered for the Fawn Design bag! I’m due with my first baby in September and am trying to save up to buy a Fawn Design diaper bag but getting one for free would be even better!! I love your all American little family so precious! And your style for the fourth is perfect!! Pick me for the giveaway! I would absolutely love that fawn bag to carry all the stuff my twin’s require!! Obsessed with that Fawn Design bag!! ? These are the cutest photos EVER!!!! This is the cutest! In love with the bag…fingers crossed ? Love your beautiful blog! I looove this gorgeous backpack as well! I tagged 10friends on each picture and followed…crossing fingers to win!?❤️?? Happy 4th of July to your beautiful fam! Absolutely love these photos, especially the giant American flag!! ?? Happy Fourth!! I don’t know what I love more than a backpack or a yummy recipe ! ☺️☺️☺️ Thanks for all your cute inspiration and posts!! I love the Fourth of July because it’s an excuse to celebrate our country! It’s such a special holiday! I also just love everything about your families patriotic outfits! Darling!! Gorgeous Fam! Wouldn’t be mad if I won that bag ??? I love following you❤️ You have the cutest fam!!! I’m in love with the fawn design bag!! This 4th of July will be personally, my first without my son and without fireworks (which I’m totally bummed about because I adore fireworks and our first 4th of July not being together). My son will be spending time with his father who is undergoing some hardships at the moment. But I would just like to say that you have a beautiful family and I love all the patriotism! It’s adorable! Thank You Rachel for sharing your ideas and pictures on how to celebrate the 4th right! ? Beautiful family you have! I hope to win the giveaway…fingers crossed ? The pigtail and bandana combo is the cutest thing ever! And LOVING your Poppy FawnDesign bag! ? This is so cute! So excited and I hope I win!! So excited for the bag giveaway! P.S. Y’all are so adorable! Love everything about this site!! I love the poppy fawn design bag! The color is amazing! I stumbled across your blog because of the fawn design giveaway and I am SO glad I did! I’m a sucker for cute kids, fashion, and family so I think this blog is right up my alley! Not to mention that pink peonies are my absolute favorite flowers..and they’re in season!! Recently I’ve found that all of my favorite companies are Utah based, so much talent in your area! Anyways, love the blog and will enjoy following along! Your family is the cutest and I really need a new diaper bag .. preferably from fawn design ?? I LOVED watching your instagram story of your fam celebrations! Your smores dessert looked amazing, and I can’t wait to take my littles out for festivities as well!! Leaving comment for extra entry on giveaway! Is this where we do it? 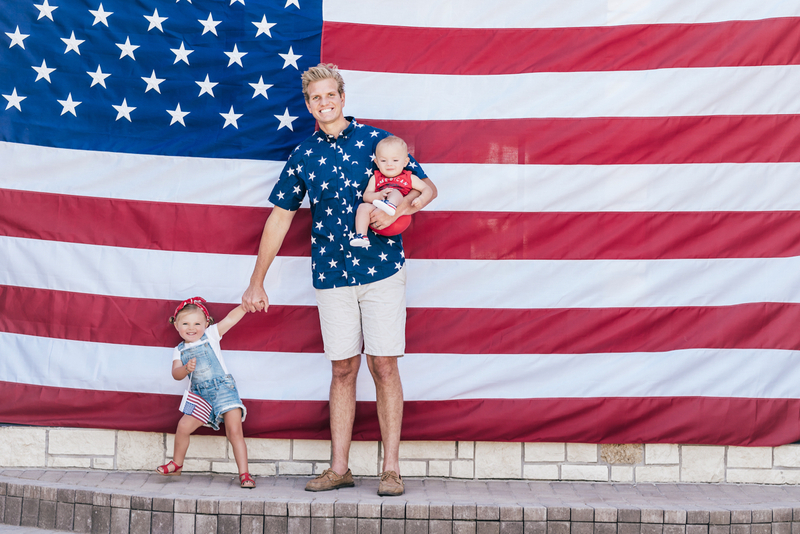 Love your sweet family and your patriotic outfits. Absolutely adorable. Beautiful session and family! Isla, Dash and Jack are stunning! Rach and Drew are a beautiful couple!! You guys are the cutest!! 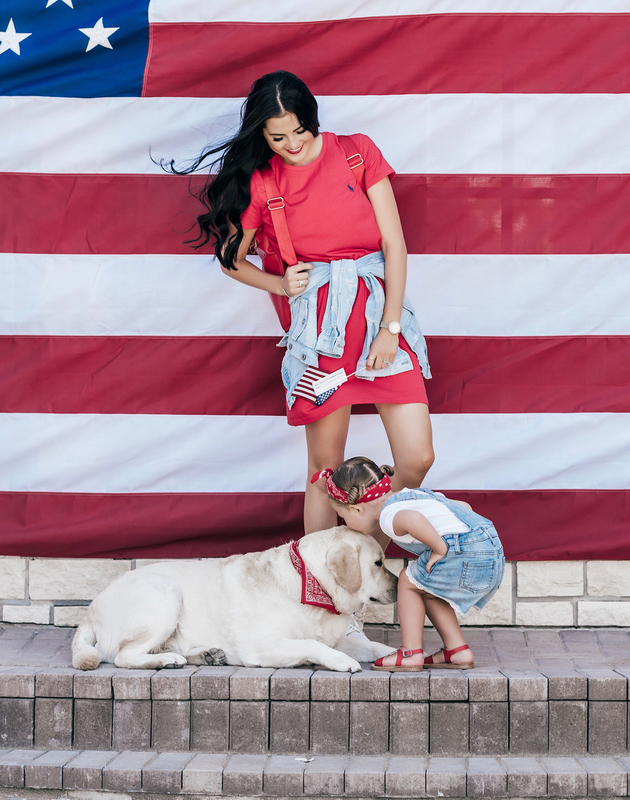 Love that you included your dog in the shoot… And so drooling over that Poppy bag! ?? The color of the fawn bag is gorgeous! Amzingbphotos and I’m trying that recipe tomorrow! Yum! Cutest pictures! I love the outfits. We have a parade tomorrow and I was looking for some inspiration! Isla’s outfit is adorable! ?? ? I totally agree your daughter overalls and shoes are so adorable! These photos are so adorable! Happy 4th! I LOVE these pics! Your daughter’s overalls are spot on :) So jealous of your #fawndeisgnpoppy! They sold out before I could snag one. Such a beautiful family!! Love the outfits! So cute! Love that bag and cute family! LOVE the big flag pics. So beautiful! And what is it about s’mores that is SO 4th of July?! I did s’mores brownies last year and they didn’t disappoint! :) Hope your family has a wonderful holiday! Love your style! That poppy bag is gorgeous! Your little girls overalls are so adorable! I love everything about these pictures, your outfit is amazing and I am so in love with that bag! Hi! Cute blog! I would love to be entered in the fawn design giveaway!! Pretty pretty please ? Love love love the poppy bag? Super cute family and the pictures turned out perfect!! What beautiful images! Love your blog! So cute! Love the red dress! Cute kids and those smores look amazing! Just found your blog from fawn design! So cute! Hope I win the bag! Fingers crossed. Have a great 4th of July! ? ?? Your family is just too cute! I love these bags!! July 4th is also one of my favorite holidays!!! ??❤️?? 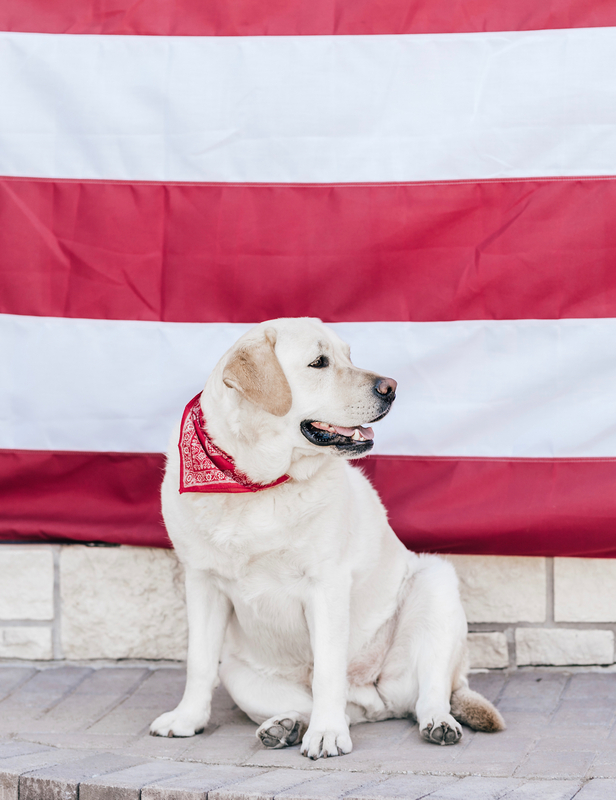 I will confess, I initially only hopped on your site to enter the fawn design giveaway, but once I saw your precious 4th of July photos I was very intrigued and signed up for the email subscription. My husband is in the military and will deploy shortly after I give birth to our very first baby in October. We always cherish this holiday, as it is near and dear to our hearts! Happy Independence Day!!!! Love all the outfits! !❤️ Such a cute family! 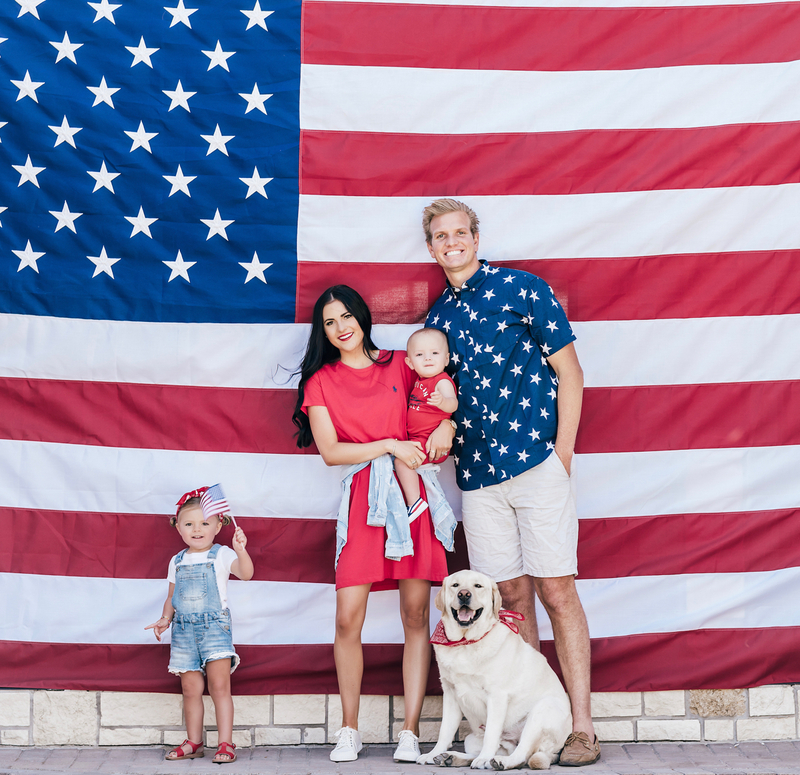 Love your families patriotic outfits and flag! The 4th of July is hands down my favorite holiday! LOVE, LOVE, LOVE! ❤️ You have such a cute & fun family! Happy Fourth of July ?? I hope I win! ? I LOVE every single picture and your 4th of July story is so super sweet. Your children will appreciate all the hard work you put into making memories. The huge flag for your house is AWESOME! Hope you have a wonderful time celebrating!! great family pictures!? love the red diaper bag!? also i would love to have pictures like these with boys in the future! ? So stealing that s’mores recipe! Looks so easy and yummy! That s’mores dish looks incredible! I’ll definitely have to try it! You have the cutest little family and I love following along with your adventures together. ? Your family is so darling! I especially love the little overalls!! I just found your blog and I think I’m going to love it :) thank you for the chance to win that amazing diaper bag! Happy Fourth of July! Can’t wait to try your s’mores dessert. Looks yummy. 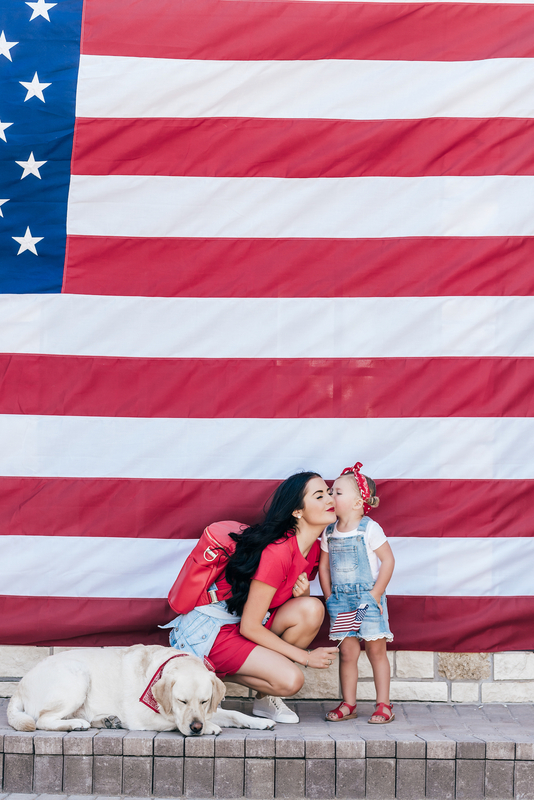 Beautiful photos and a very happy fourth of july to you and your family! LOVE the festive outfits with your matching bag!! 4th of July is one of my favorite holidays! I need to get a big flag like that too! Love it! LOVE these patriotic outfits! Those bandanas are the cutest! Want one for my own pup:) you have such a beautiful family! Cutie fam! Love the flag backdrop, outfits and bag!! Loveeeeee these pics! Your family is the cutest! Jackson’s shoes and Isla’s bandana are my fav!! Y’all have a happy 4th!!!! Thank you so much for the fawn design give away!! I’d love to win I hope I do. Anyway thank you again ? Awww I love love love your fourth of July family pics!!! So adorable. Have a great one! This is so adorable! That poppy bag! !.❤️ I hope I win!!! LOVING the red Fawn Design, those s’mores, and those sweet babes? My husband and I recently found out we are pregnant! This will be our first baby and we are so excited!! I loooove the dawn design bags and would be so happy if I won this giveaway it would be the perfect bag to go along with our cute babe!! That s’mores dish looks so yummy!! Would love a fawn design bag!!! Love it all!! Such beautiful pictures! You have a gorgeous family :) also, totally rockin’ the Poppy bag. I love it! I just found your blog, and I love it! You have such a cute little family! Happy 4th of July!! You have such a beautiful family and such pretty Photos!! happy 4th of July ?? You have a beautiful family and such great pictures!!! happy 4th of July ?? Isla’s outfit… I can’t even! So stinking cute!! I am hosting on the 4th. My husbands family comes over every year. The kids love the pool and it’s just a nice relaxing (fun) day for everyone. I’m making patriotic rice krispie treats (wish me luck) and I’m going to attempt to make your sweet treat above. (again, wish me luck) I hope you have a great 4th!! Such cute pictures!! I am in LOVE with your fawn design bag!!! The color is perfect! Cutest little fam! You are beautiful! Love the fawn design bag! 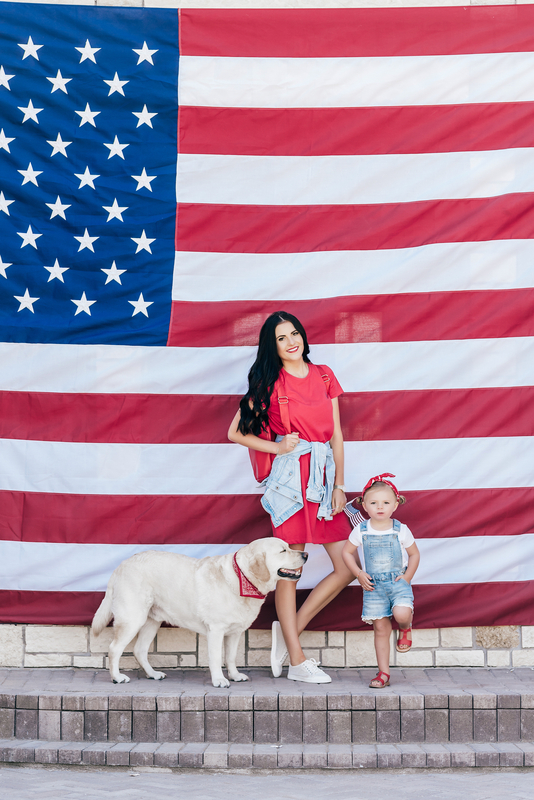 The Fourth of July is one of my absolute favorite holidays and I’m DYING over these family photos!!! 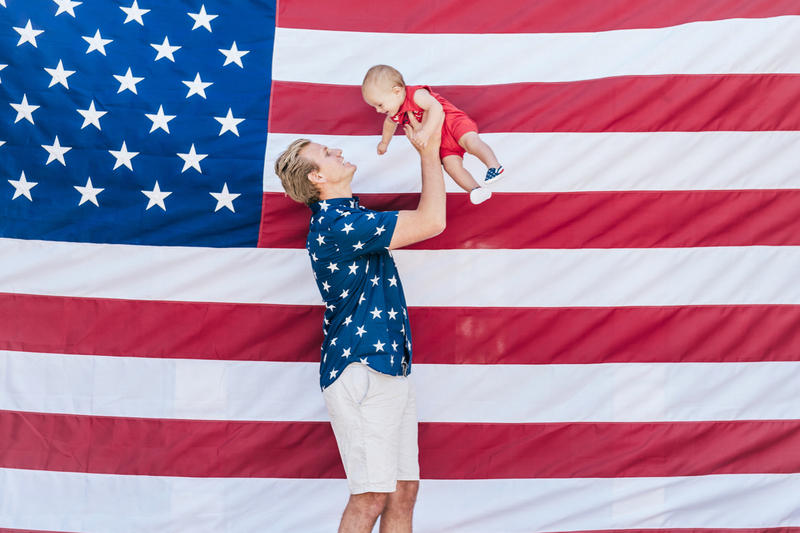 My husband is in the military, so Independence Day has a very special place in our hearts and your photos will definitely serve as inspiration for our first 4th next year as a family of three (we are expecting our first in October)!!! I initially visited this site for the fawn design giveaway, but I’ll definitely be following! ??❤️?? Your kids are darling! And I can’t wait to try that s’mores recipe ? Great family photos! Especially love your Fawn Design Bag :) Happy Fourth of July! Your day looks absolutely dreamy! && can I get hallelujah, amen for those gooey smores?? Ohhh yummy! Those s’mores look amazing! OML stahhhhppp! These pics are too adorable and your family is so beautiful! Happy 4th! We are staying home and grilling out in the backyard with family! We will also watch our local town’s 4th of July parade on TV. 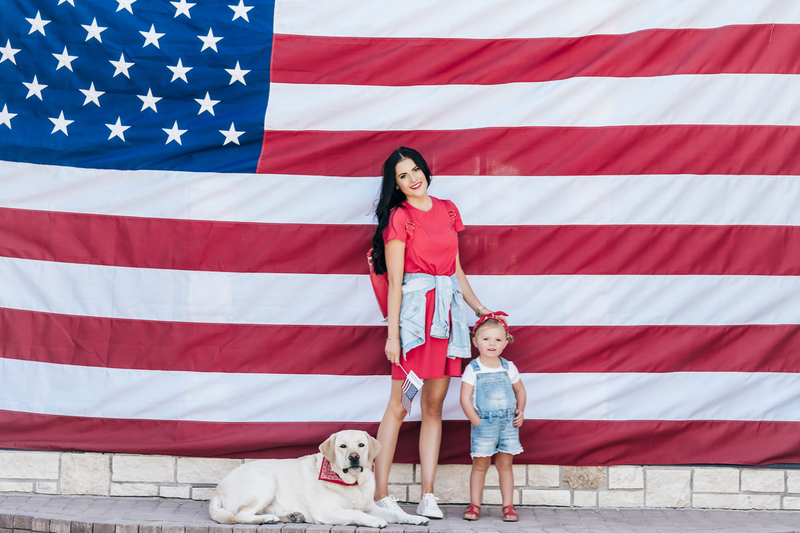 Your whole family looks so cute in red, white, and blue! Have a lovely fourth of July! Love all these pictures and your families coordinating outfits! One of my favorite things to do for holiday as well! ?❤️ Dying for one of the poppy fawn design bags! Hope you have an amazing Fourth of July! ?? Love these photos!! Happy 4th! 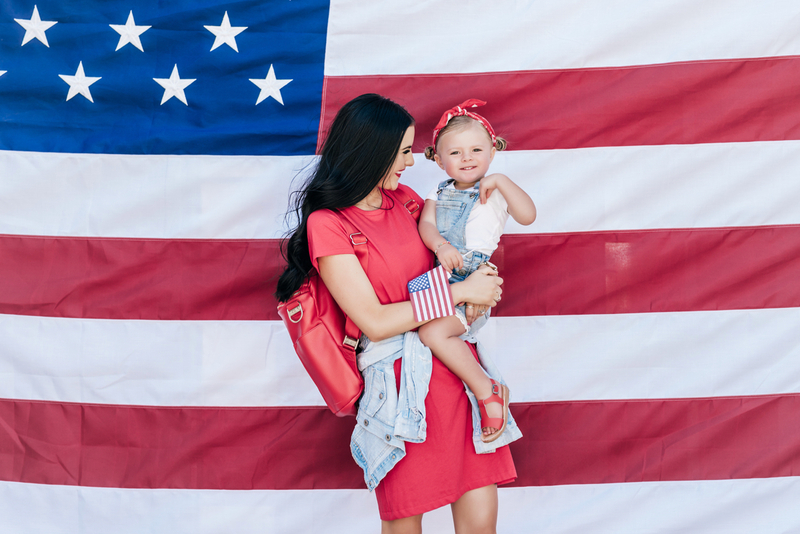 Happy Fourth of July to you and your beautiful little family! ???❤️? This photo shoot is the greatest!!! And that fawn bag is to die for! With my growing little family I’m trying to start traditions my family never did and this photo shoot has definitely made the cut, hopefully we all cooperate enough for it including my teething babe. And the recipe has already been screenshot ❣️ Hopefully I have it all perfected for an amazing fourth next year! Your family is so adorable! Happy 4th! Just entered your giveaway. Love you blog and this bag looks amazing. Baby boy #2 due in December. Would love to win this bag!!! These photos are awesome! Love your Fawn bag. Happy 4th! Love the pics! And Fawn Design! ???? Love matching with my little one. So cute!! And that bag ?? love it! Cutest family, cutest bag! Happy 4th! I can’t wait to make that dish either ✌??? You’re family is the cutest!!! Love the photos!! We will br kicking back at the pool and BBQin’ celebrating the 4th! Oh. My. Goodness!!! That s’mores dessert!! Going to be trying this one ? Again, so glad I found your blog! What a picture perfect family! I am in love with Isla’s overalls! ? These pictures are amazing!!! That bag is…amazing!!! I had no idea the fawn design bag came in red. How fun! Love the pictures! Cute family! Thank so for the giveaway! Love that poppy color! & need to try those snores stat!! We spent part of the weekend on our boat and today we went to the zoo–where the fawn could have totally come in handy. Your family is the cutest! Love your coordinating outfits! Ps love fawn diaper bags and would love to have one! Wow these pictures are amazing!!! I love how patriotic and gorgeous your family is! ?❤️?? Happy 4th!! What an absolutely adorable family!! I love the flag, makes for the perfect backdrop for this shoot ❤️❤️ And oh mercy me that smores dessert is everything I need and don’t need at the same time lol! I love the giant flag!